WORLDJAZZ: News 2007 - Is Jazz Dead ? 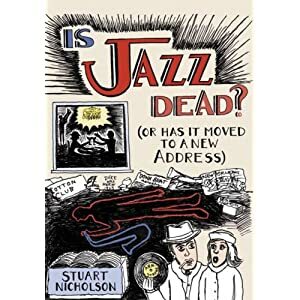 News 2007 - Is Jazz Dead ? This book should not be judged by its ugly cover, its clumsy title or its numerous typographical and other errors. Nicholson's thesis is important, and he supports it persuasively. His argument is that all the significant changes in jazz have come out of the United States--until now. Nicholson claims that today, "it is non-Americans who are taking the lead." A corollary argument is that "the people who are not discussing the effects of globalization on jazz are Americans." Nicholson believes that the pendulum began to swing away from America in the 1980s, when "neoconservativism" stifled innovation. His book contains one of the most devastating indictments of the "Young Lions" fad in jazz literature. But Nicholson also acknowledges that, in the new millennium, the art form has become fresh and restless and diverse again (notwithstanding its economic challenges), both inside and outside U.S. borders. As jazz globalizes, new tributaries enrich the mainstream, and influences flow in all directions, including back and forth across the Atlantic. It is in explaining this globalization (and "glocalization," wherein artists incorporate their own national imagery and folklore and culture into the language of jazz) that Nicholson is best. For ethnocentric Americans who need help finding great, style-making jazz beyond our shores, Nicholson's guidebook is invaluable. I'm sure Stuart Nicholson didn't intend to make me want to hang myself. Unfortunately, his writings on jazz's recent reactionary past, fragmented present and uncertain future have practically that effect. Nicholson's thesis--that America's inclination to treat jazz primarily as a business has resulted in artistic petrifaction--hits the mark. Case in point: the recent plethora of pretty boys and girls singing Tin Pan Alley tunes, and a concomitant decline in industry resources devoted to nurturing originality. Rampant conformity in the guise of Wynton Marsalis, Jazz at Lincoln Center and cookie-cutter jazz education are also taken to task. On the bright side, Nicholson finds much to like about jazz overseas; he clearly believes (with good reason, perhaps) that the European cultural tradition makes the continent a more fertile ground for growth. In the process, however, he underestimates the state of the music in the U.S. Nicholson has a superficial grasp of American jazz: If it ain't on a major label or otherwise a part of the mainstream jazz biz, it essentially doesn't appear on his radar. Gary Giddins once opined in these pages that "Jazz is dead" ranks as one of two stories that jazz scribes can easily sell to glossy magazines--second place going to "Jazz is back!" So naturally turning the first statement into a question offers the perfect starting point for a book that supposedly "is bound to be controversial among jazz purists and musicians." Stuart Nicholson actually devotes more time to his subtitle, concluding that this American-born music is stagnating at home while, around the world, it continues to follow its natural course and evolve, thanks to musicians who add their regional influences to the musical brew and governments that put artistic merit before profit. Two chapters are devoted to an honest critique of Wynton Marsalis: one for his music, the other for his work with Jazz at Lincoln Center. Nicholson also explains the shortcomings of jazz education and the way European musicians "glocalize" jazz, by adapting it through local influences. The book makes some valid points, but many of them get lost among the laundry lists of European players and longwinded sentences that seem like Nicholson is still working through ideas. Further, the answer to the title is never in doubt from page one, making it seem like a cheap publicity ploy than a serious question.